Inches and centimeters are both units of linear measurement. Inches are used in the American system, which is sometimes referred to as the English system. Centimeters are a unit of measurement in the metric system. In the United States, the American system is the most commonly used method of measurement. This system uses inch, foot, yard and mile for measurements of length. The U.S. is the only industrialized nation that has not adopted the use of the metric system. The meter is the basic unit on which the metric system is based. Because the metric system uses a standard conversion factor, it is usually considered easier to work with. Ten millimeters equal a centimeter, 10 centimeters equal a decimeter and 10 decimals equal a meter. One inch equals 2.54 centimeters; one foot is 0.3048 meters; one yard is equal to 0.9144 meters and 1 mile equals 0.621 kilometers. The standard U.S. ruler is divided into inches, with marks dividing each inch into sixteenths. 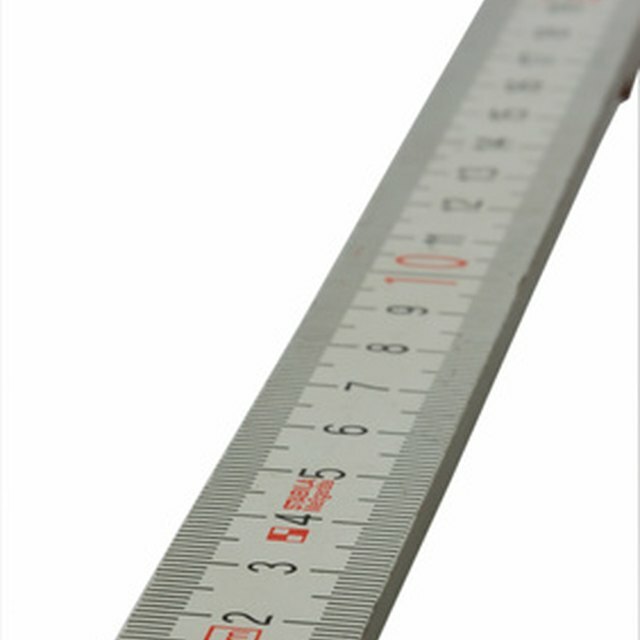 Metric rulers are divided into centimeters, each with ten marks showing millimeters. Rulers showing both standard and metric measurements simplify conversion from inches to centimeters. U.S. scientists commonly use the metric system, in order to standardize the measurements used in experiments around the world. Messali, Janice. "Difference Between Inches & Centimeters." Sciencing, https://sciencing.com/difference-between-inches-centimeters-5782196.html. 13 March 2018.